Well I found my way back to my blog from days gone by. I have made a few things to sell and made a few things for an embroidery shop. But I find my heart going back to Angel Gowns. For some reason making something to give someone feels so good. I have made a couple of Angel Gowns and have been getting my patterns together. I need to have a gown, bonnet, diaper and booties. And for a mother that receives this she gets a burial gown, typically white or cream along with a bonnet. So a set will be 2 gowns, one white for burial and then another gown to take pictures while still at the hospital. I have a set almost complete using a combination of patterns. I also plan on making little cocoons for the babies to tiny to dress. The family will get the little cocoon and can use it for picture taking if they want. 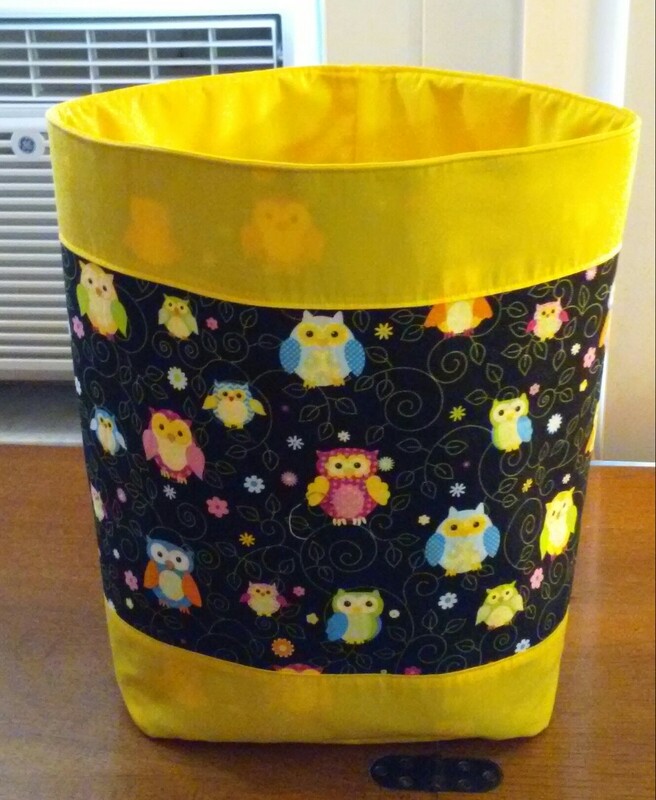 But this is usually made from soft flannel that will be absorbent when the tiny baby gets placed in it. I have bought some flannel and have picked out a pattern I love so I will work on these as well as the Angel Gowns. There will be a little charm attached that the mother can take with her as a memory. I will need to create a Facebook page so people that donate wedding gowns can see what I have made from their gown. I do have a gown that someone donated that was made for her mother in law in 1955. It seems to be in great shape. And it will be the next gown I take apart for angel gowns. I will post before and after pictures to the facebook page. I have decided to name the page after a poem I wrote. I will share that poem when I create the page. Well for those of you that don’t know, the event I had planned for the end of April didn’t happen for me. I got really sick and just could not do it. 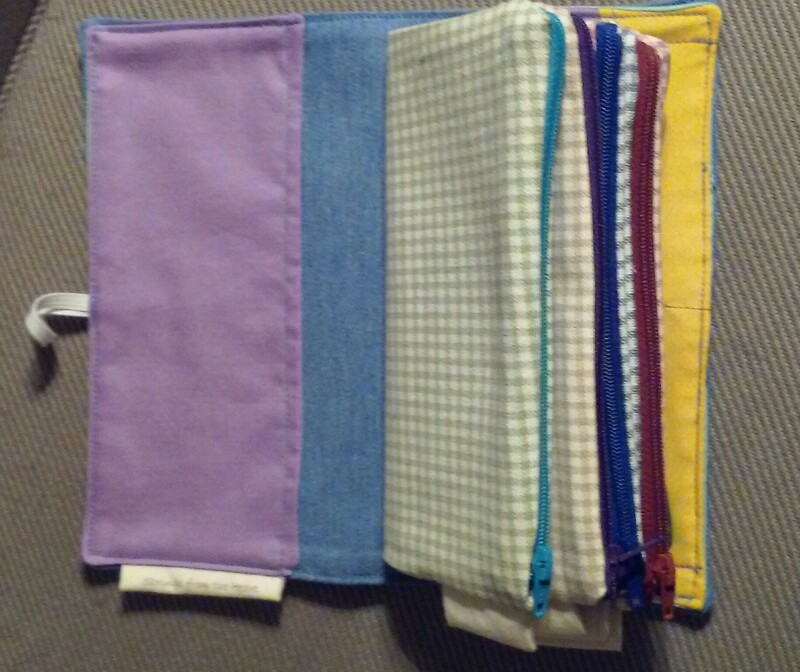 So needless to say I do have lots of doggy bandannas I need to post in the store. I did sell a custom doggy bandanna to one of the salesmen at work. He told me what he wanted for his little girl who is all grown up now and I made it. It did look right purty!!! 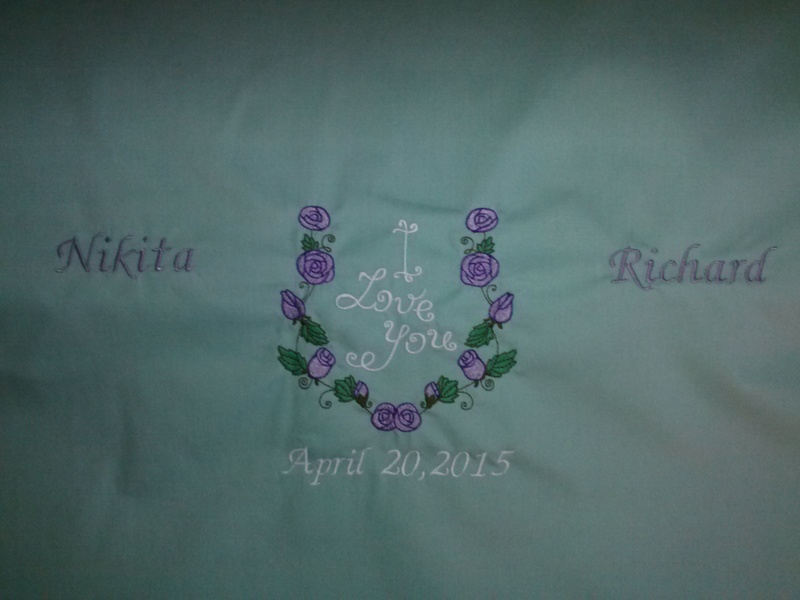 I have managed a bit of sewing, impromptu though it was I made a pillow for my niece Niki and her new hubby Richard. I had just gotten some new embroidery patterns and there was one that was screaming make a pillow. So I made the pillow that Saturday morning, finished it and took to their party that night. LOL nothing like a rush pillow. Then I was walking around in a funk, I felt like I couldn’t find anything to embroider, my son bought me the coolest birthday present though for my embroidery machine. It’s a rack that goes behind the machine and allows you to set up 10 thread colors at a time. I need to make a bigger top for my embroidery machine stand since this sits behind and to the right of the machine. So that will be an up coming project. Then this weekend I was in another funk, gotta get my groove back. And I was once again looking for something to embroider and I got to thinking. I sewed before I embroidered sew why do I need to embroider in order to sew. Know what I mean? I worked on a back pack today, need to put the grommets on it for the strap to go through and it will be finished. Sew that will be my attitude from here on out, don’t look for something to embroider, instead look for something to make and IF it has embroidery thrown in then so much the better. Yes I have signed on for another event. This one is also dog related. 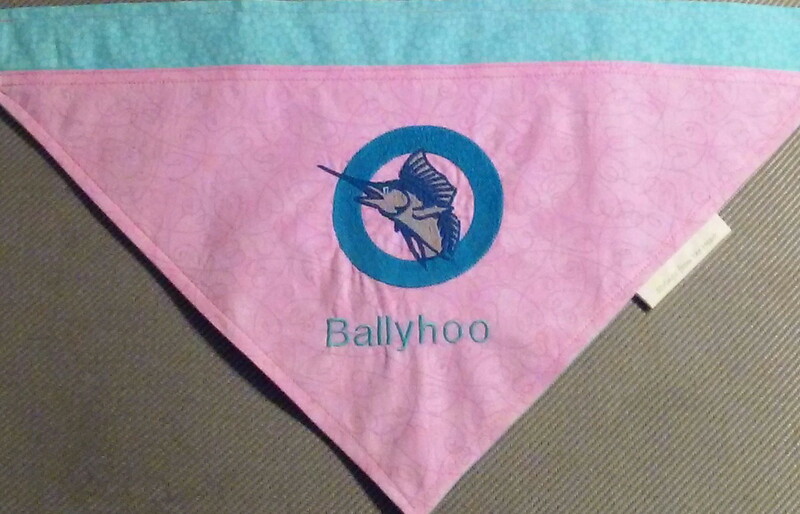 I will make a few more bandannas for the dogs. I need to work on displaying the items I do take. AND I need to find an inexpensive tent to go over my table. I got sunburned at the last one but I did the event knowing I didn’t have a tent. That event got me a personal invite to the event I am doing on April 18th. This one will be the Wine & Woof event for the Office Depot Foundation. It will be at their headquarters in Boca Raton. This one will be 4 hours which isn’t so bad. I also got an invite to an event being planned by Christie’s Critters. Christie is a local radio personality, I met her at the event I just did and she asked would I be interested in doing her event in Sept. and I said yep sure would. So now I have 2 more lined up from the first one. Am I crazy? Maybe but I love sewing and I love animals so combining them together is so much fun.